Little Steps was recorded at MorningStar Studios in Springhouse, Pennsylvania. Engineered and recorded by Glenn Barratt and Thomas Petroski, Jr. Mastered by Glenn Barratt. 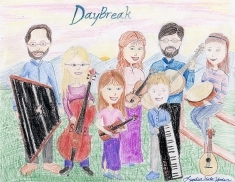 Produced by Cliff Cole and DayBreak. The cover photo of Seth’s little steps into the Atlantic is by Anna Lisa. 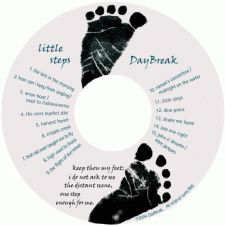 The CD graphic design and layout is by Rob. Cliff’s hammered dulcimer was built by James Jones of Bedford, Virginia. His website is www.jamesjonesinstruments.com. Anna Lisa’s mandolin and bouzouki are both flat-top koa models made by Flatiron, formerly of Boseman, Montana. Her violin is a good old German copy of a Guarnerius. Rob and Anna Lisa made their walnut and spruce mountain dulcimer back in 1983 from a Folkcraft kit . The concertina that Rob plays is an English style Bastari. Rob made his first guitar, a 000 model now owned by Cliff, back in 1996. He made the Dreadnought he plays on Little Steps from a maple Martin kit in 1998. Rob and Anna Lisa’s sister, Chara Histand, made their harps together in ‘97. 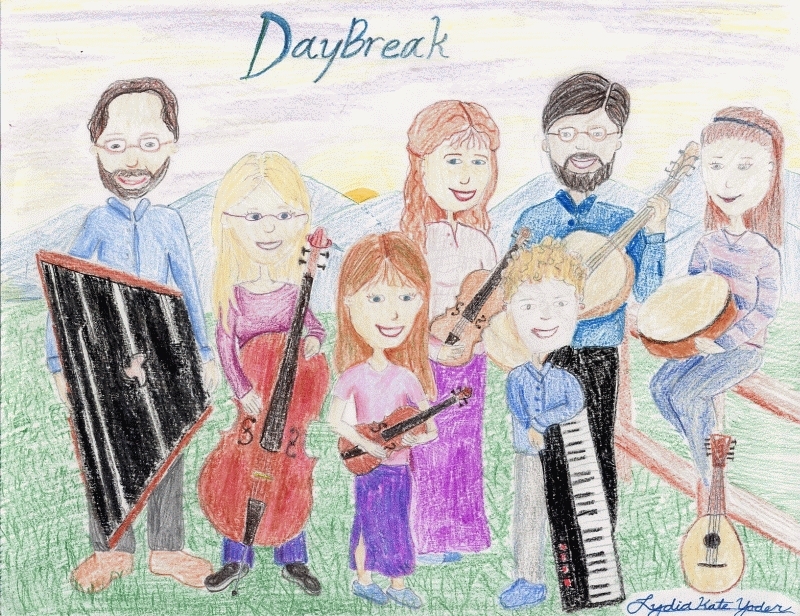 Then 12-year old Lydia created this fun caricature of DayBreak for our Little Steps CD release party. Rob’s harp is a butternut, maple, and spruce, Paraguayan-style 36-string harp, built from the plans and video of harpmaker John Kovak from Front Royal, Virginia. You can find John along with his harps, harp plans, videos, and recordings on the web at www.johnkovac.com. Denis’ guitar is an 1981 Alvarez made by Kazuo Yairi. He plays Feadóg and Generation tin whistles. Words by Bill Caddick; Music by Bill Caddick, adapted from Tchaikovsky; Published by Rough Music.